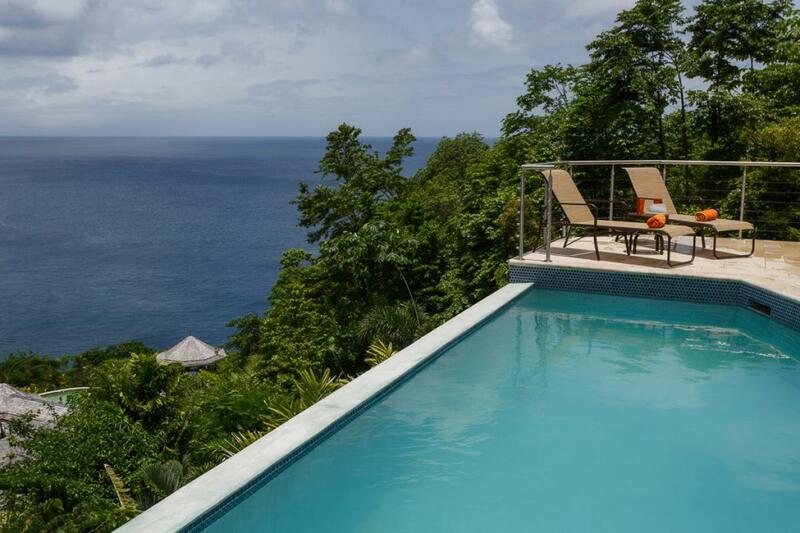 The Villa Trou Rolland located in the quiet, pristine bay of Trou Rolland – right next to Marigot Bay. The villa stands elegantly up on the hillside with a magnificent view overlooking the bay and out over the ocean’s horizon. A private infinity pool, large patios, and bay windows provide for breathtaking viewing points from all over the house. Plus, you can easily go down to the beach, where there is rarely a footprint. Or if you’re looking for a little more action, just hop over the ridge to Marigot Bay where there are plenty of restaurants, shops, and things to do. A driver will meet guests outside of custom's area and drive them to the villa (extra charge). If guests pre arrange for a rent car, it will be delivered to the villa. The villa was everything we hoped it would be, and much more! The grounds were well-kept and everything worked great. The views were amazing, and I don’t think any of us got tired of waking up and seeing the island each morning through the bedroom windows or out on the decks. The place was very well kept and extremely clean. Andrew was great. He had an answer for everything and absolutely steered me in the right direction every step of the way. I will have no problem booking through WhereToStay.com because of him. Thank You! Trou Rolland is truly amazing. The home is spectacular, the decor is very nice, and the views are breathtaking. You could easily spend a week at the house. We ventured out and did many excursions while my parents spent time at the house. The home has easy access by car or walking to Marigot Bay for restaurants and arranging excursions. The kitchen provides everything you need if you want to make meals at home, too. It was very convenient to have the washer and dryer. We loved having the A/C off during the day to enjoy the ocean breeze. We did use the A/C at night, but it was not necessary. The outside seating was perfect. The only thing that would have made it better was if we could have stayed longer! We will be back. Andrew was an invaluable help, starting with helping us research where to stay. Once we decided on our destination and villa choice, he was always available to answer questions and provide useful information for the questions I didn’t know to ask. He was great and made sure our family trip was perfect. Spectacular Villa & Grounds & Views and memories to last a lfetime!! My husband and I celebrated his 65th birthday with two other couples at Trou Rolland Villa. We all LOVED everything about this villa. We at all breakfasts in, most lunches and a few dinners during our eight night stay. The grill and outdoor seating for dining made for very special memories. We spent a couple of entire days at the villa in the fabulous infinity pool, enjoying ‘every seat in the house’ and on the decks, as all are awesome for viewing this beautiful part of St. Lucia and the sunsets! We relied on local taxi service (Anthony) for airport transfers and to take us up and down the hill to Marigot Bay for dinners out (Anthony’s wife baked my husband a fabulous birthday cake). And we spent two days on the water with Captain Denver and Dillon (Shashamane Water Taxi and Tours) who are absolutely lovely and have a wealth of local knowledge. We toured Castries and Rodney Bay with them twice, once on Leo’s birthday. We also toured the Pitons, botanical gardens, and several beaches with Shashamane; they even had rum punch and snorkeling gear on board and fishing rods for us to catch our dinner - cleaned the fish for us, too. Andrew was immediately responsive to the many questions I had prior to booking and Nina was wonderful greeting and orienting us on arrival and provisioning, as we requested. The villa staff could not have been more warm or accommodating on the days they were onsite….barely knew they were there. Thank you Andrew and owners for making this vacation fabulous! Andrew was wonderful to work with! As I made plans for our party (who had not travelled together before), he addressed every one of my many questions, understanding that I felt very responsible in ensuring everyone’s comfort and meeting the requirements of all. It was extremely meaningful knowing he took seriously the needs and wishes of all six of us. He readily responded to emails and phone calls and swiftly got clarifying answers to questions. He also initiated contact with us over the six months between booking and arrival to make sure we had transportation, provisions if desired, etc….knowing that our reservation with WhereToStay remained on his mind was a great comfort. Thank you very much to the villa owners who maintain their property beautifully and share their magnificent home, so others can have memories that will last a lifetime!